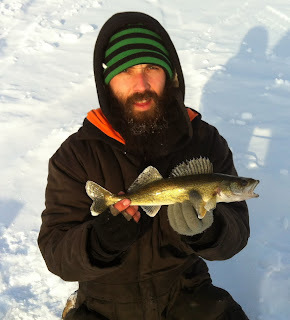 The Bearded Angler: Round 2 ...... Fight!!! 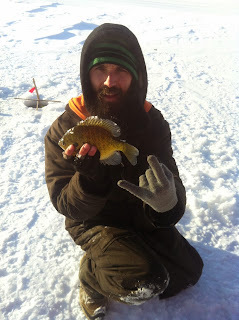 After a truly fantastic outing for bluegills, I had the itch and we decided we would head back and try our luck again. A few days later we were off to the same lake as our previous trip, but this time earlier. We made it to our spot by daybreak and met with a second group of anglers as we had arranged to. It was cold out, -30 or so, that meant shelter and heat was a priority so we punched a bunch of holes where we had success days ago and set up shop. 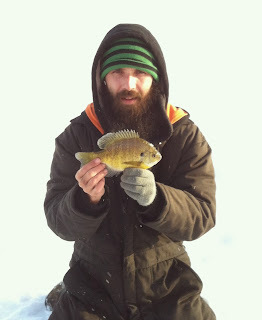 The first few fish landed were perch ranging from 3 to 9 inches, not what we were after. The clouds above at daybreak had all but disappeared and it was warming up significantly with the wind dieing down. I started to try a few holes outside of the shelter in a little bit deeper water and found some more responsive fish. It wasn't long before I iced a nice bluegill followed by a few missed bites, sniffs and follows. Hopping between holes for about an hour I landed two more and missed a couple, key here was watching the rod tip for the tiny quiver of a bite. We relocated the shelter over the hottest hole and continued fishing. Looking down one of the fresh shack pattern holes it was obvious we were half on top of a sunken tree, the water was so clear you could see it down below. Structure!! !, although it was difficult to vertical jig in it with a lot of sonar interference. Again it seemed there were more perch below us than bluegills, as the tent beside us was hammering them with tiny pieces of meet. It wasn't long before the mid day drawl was upon us and after a quick snack, a few of us headed to a near by bay to see what we could find. Ten holes or so about twenty feet apart were drilled and down each one we were seeing very large marks uninterested in our tiny offerings. It was here I landed a few 12-14 inch walleye which were a great fight on the ultra lite rod with two pound line. It became obvious we were not on bluegill grounds so we headed to a point with a weed line and punched a few more holes. The wind was picking up again and line icing up easily, the spot could have been good, but weather was making bite detection difficult. With two hours to go before sundown and a long drive home we made it back to our original spot to warm up and hopefully catch some more. I figured like the previous trip, it was just a matter of time before the bite would pick up and had confidence in our original spot so I sat and waited it out. 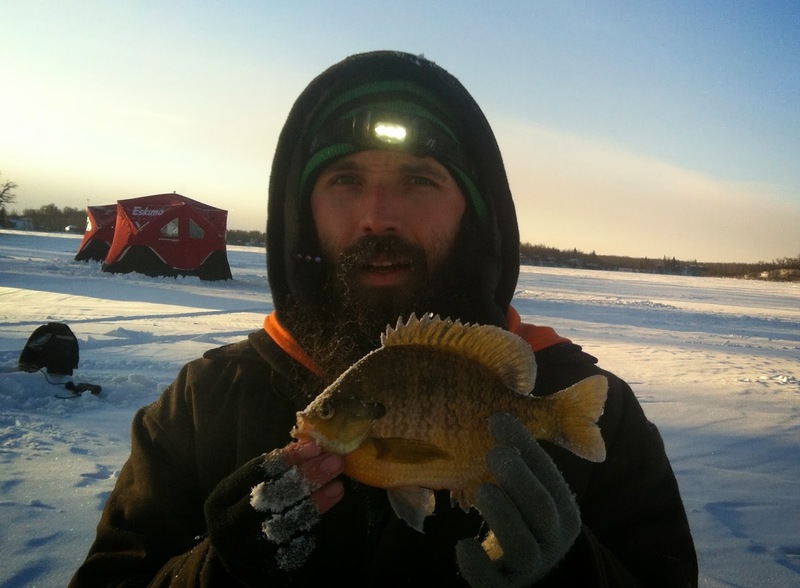 A few perch and a walleye, were caught using erratic lifts, and then it was time for the subtle finesse for the bluegills. The clouds rolled over as the sun was going down and I was able to coax a few more gills to bite. All in all the action wasn't as steady as the previous trip, less bluegills were landed but more species were caught.